The trouble with a book titled “Gamification by Design: Implementing Game Mechanics in Web and Mobile Apps” is that most people will assume it’s meant for games – or at the very most, application – designers. But “Gamification by Design” by gamification expert and chair of the Gamification Summit Gabe Zimmerman, and entrepreneur and veteran technologist Christopher Cunningham, is a lot more than that. If you’re not familiar with the term, gamification is essentially the idea of using game thinking and game mechanics to solve problems and engage audiences. In fact, gamification is already seeping into many parts of our lives – but it’s recently especially prevalent in web and mobile applications. Mobile location-based check-in service Foursquare, for example, was one of the first few mobile applications to employ a “badge” system to reward usage and consumer behavior – but by no means the last. Even mobile running application Nike Plus employs tried-and-true game mechanics to encourage runners into running ever longer distances. In the book, you’ll learn about the different aspects of rewards systems, levels of social engagement and experience progression that can not only be applied to frivolous games or useless mobile apps, but also leveraged for building products and services, as well as marketing campaigns. There’s also game psychology involved – for example, do you know that there are different player personalities who look out for different forms of satisfaction in games? Which essentially means that if you’re looking to build a community, or encourage virality of a message through your intended audiences, you’ll need to apply different strategies to attract and retain them. For sure, parts of the book speak directly to game and applications designers; in fact, two whole technical chapters within the book is dedicated to programmers for coding game mechanics. But to bypass the book because of this would be to miss the forest for the trees: that gamification of real-world experiences is going to happen, and is increasingly crucial for mobile and online experiences. 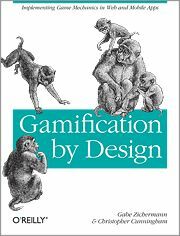 Zimmerman and Cunningham has put together a masterpiece in “Gamification by Design” – if you’re a games designer or application developer, this is essential reading. And if you are a brand marketer, a user experience architect or even a client-facing suit from a creative agency, understanding the concepts within “Gamification by Design” will make you that much better a professional in your own space.